A shotgun can be used for more accurate shooting than just spraying a ton of BBs towards your target. That’s where slugs come in. Slug guns are widely used for hunting all kinds of game. Plus, the sheer power of a shotgun also makes it an admirable home defense weapon. Mounting a scope on a shotgun might seem a vague idea, but it has its own benefits, especially with slug guns. Here, we’ll learn about the features of a slug gun and the advantages of mounting a scope on it. We will also review the best slug gun products on the market to help you choose one for yourself. So keep your eyes pinned on the screen. What is a Slug Gun? A slug gun is basically a shotgun that uses a different kind of projectiles than normal shotgun cartridges. These guns shoot slugs instead of metal BBs. That’s where the name comes in. A slug is more like a bullet used in handguns and rifles. The benefit of using slugs is that they improve the pinpoint accuracy of your shotgun. Buckshot cartridges spray an array of pellets towards the targets, which is not very effective at long range. Plus, they don’t allow for a humane kill of a game at distant range. On the other hand, a slug acts more like a bullet and allows you to hit a target at a specific point. Using slugs in your shotgun requires adding a choke. A choke is mounted towards the muzzle end of the barrel and it controls the bore diameter, so the slug can be propelled precisely. Slug guns are mostly used for hunting deer and animals of similar size. What is the Effective Range of a Slug Gun? The effective range of a slug gun depends upon the type of barrel and slug you are using. A rifled or non-rifled slug projectile, when shot from a smooth bore shotgun, can be accurate up to a range of 75 yards. 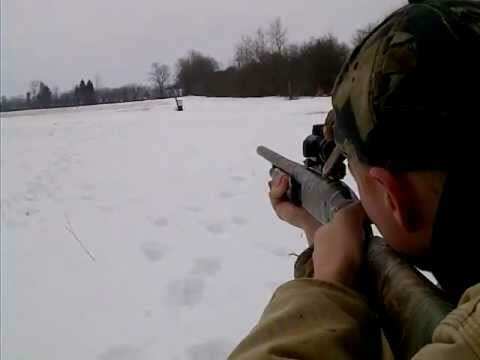 On the other hand, a slug fired from a rifled bore shotgun generally has an effective range of about 100-120 yards. If you move a step ahead and use sabot slugs in a rifled barrel, you can improve the effective range of your slug gun to around 200 yards or so. The difference in all the values of the effective range is the type of slug and barrel you are using. However, for the sake of simplicity, a simple slug in a smooth bore is dead-on accurate up to 50 yards. Having a good scope on your slug gun has its own advantages. The very first is accuracy. Shotguns are known to be not-so-accurate. Slug guns are more accurate than shotguns, and adding a scope makes their accuracy even better. The second benefit is the range. Adding a scope to your shotgun allows you to shoot targets at a distance. This lets you shoot targets from cover, especially game like deer or turkey, which are extremely attentive toward their surroundings. Having a good scope on your slug gun also stills your confidence. You can be more affirmative about hitting a target from a distance with a scope mounted on your slug gun when compared to bead sights. Having a top-notch scope on your slug gun also helps you improve your scorecard in competitions. Good optics sight a clear image of your target, which eventually helps you hit targets with accuracy. Furthermore, if you are using slug guns for hunting, a good scope also ensures that you make a humane kill by hitting game in the right spot. Since adding a scope to your slug gun has numerous advantages, it’s time to take a look and review the best on the market. These products have been filtered based upon their durability, performance, user ratings, and price. All of which are ideal. The very first and overall the best slug gun scope in this list is the Bushnell Trophy scope. 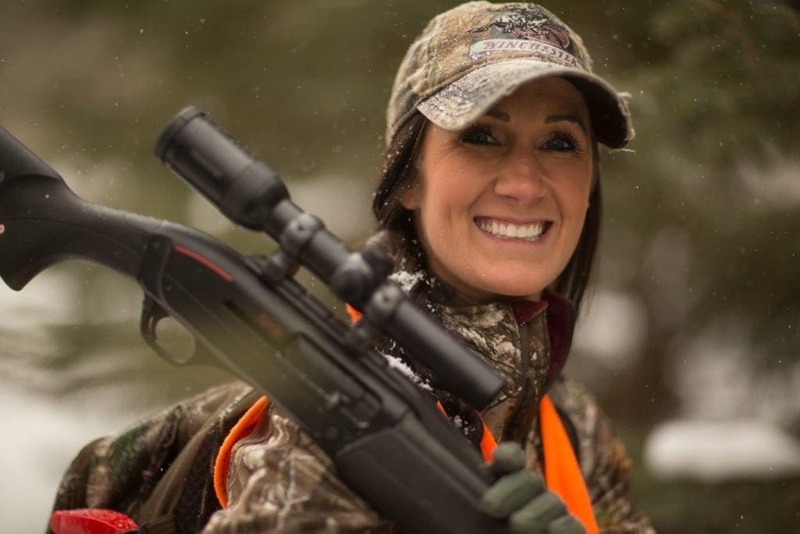 Bushnell is amongst the most reliable manufacturers of rifle scopes in the industry. 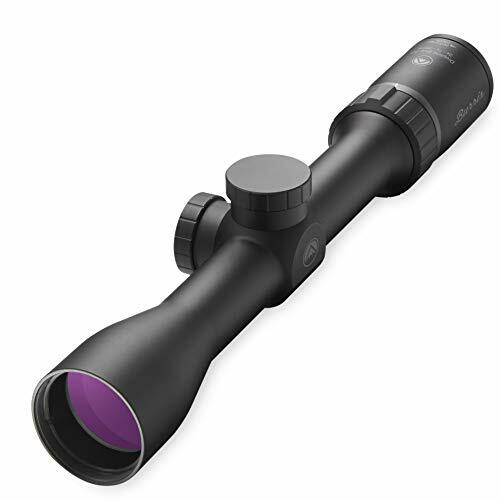 This product features a variable magnification of 3x-9x and a large objective of 40mm. The specs of this product are comparable to a riflescope. However, the points where it differs are in durability and eye relief. It features a one-inch aircraft grade aluminum tube which has been O-ring sealed and nitrogen purged to make it resistant to water, fog, and dirt. The optics are multi-coated to deliver a crisp and clear image of your target. This item has a maximum eye relief of four inches, which lets you shoot comfortably in all shooting positions. The finger adjustable turrets let you set the windage and elevation for shooting longer distances. Plus, it holds zero even under the harsh recoil of a slug gun. Other than slug guns, this product can also be used for muzzleloaders and other old model weapons. Bushnell also covers these products with a limited warranty, which is good. The Bushnell Trophy is overall a durable offering with a wide range of magnifications to open up the maximum effective range of your slug gun. The Nikon Prostaff P3 has been specially designed for use with shotguns. It has a variable magnification of 3x-9x to offer you the maximum range for your shotguns. Plus, the 40mm objective draws in enough light to project a crisp and clear image of the target, even under low light conditions. This product also features a BDC 200 reticle, which allows you to sight and aim at targets from different distances, without the need for using turret adjustments. The scope itself is made up of aircraft grade aluminum and purged with nitrogen to resist water, fog, and shocks. This allows you to take this scope on rugged hunting trips. It is fully adjustable for windage and elevation using the finger adjustable, spring-loaded, quick-zero turrets. Plus, the long eye relief lets you mount it on shotguns with the harshest recoil. The quick focus eyepiece and generous constant eye relief not only lets you use this item for sighting, but also for scouting, which is great for a shotgun. This product can improve the range of your slug gun to 200 yards and beyond, depending upon the type of load you are using. This Burris Slug gun scope features a variable magnification of 2x-7x, along with an objective lens of 35mm. The high-grade optical glass used for manufacturing the lenses is combined with index-matched, Hi-Lume multicasting aids which help with the performance in low light conditions. The best feature of this slug gun scope is the ballistic plex reticle, which is considered to be the ideal reticle for hunting. You can mount this item on the best slug guns with the maximum firing range in their class, and still not worry about accuracy. The turrets can be easily adjusted using bare hands for windage and elevation settings. It can be used for hunting deer, turkey, and other big or small animals, thanks to the long eye relief, which lets you shoot targets in different positions. This product is quite durable and can withstand the recoil of most shotguns and slug guns. The Burris slug gun scope is a low profile product that delivers a crisp and clear image of the target. This device, however, is effective only within a short range of 100-120 yards max. 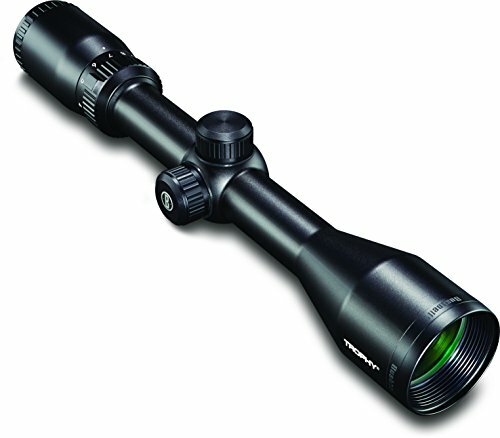 The Vortex Diamondback SFP riflescope is a somewhat non-conventional addition to this list. But it has its own features which grant it a place in this review. This product features a solid one-piece tube construction which has been argon purged and is O-ring sealed to withstand the most rigorous shocks of shotguns. That’s where the series got its name ‘Diamondback’. Other than that, the dead hold BDC reticle is good for shooting and hunting at different ranges, so you can utilize the maximum effective range of your slug gun with ease. The metal-to-metal turrets are durable and allow quick zero reset after sighting-in. Additionally, the precision glide erector system maintains accurate tracking and repetition. 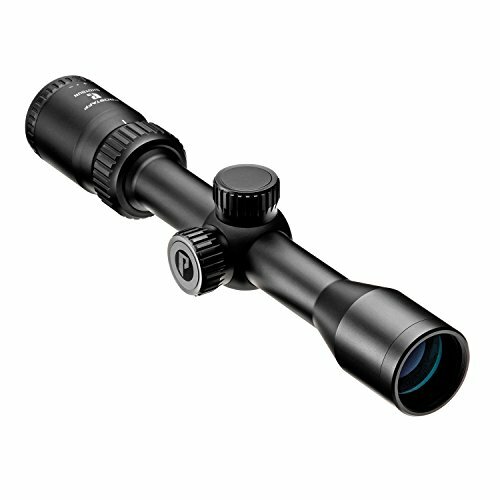 The magnification of the scope is adjustable within a range of 3x-9x. Fully multi-coated lenses offer a crisp and clear image even at dawn or dusk. The best part of using this product is that you can interchange it among your shotguns and rifles since it is easily compatible with both. The product is also available in several other magnification configurations so you have a lot of options to choose from. Plus, this item has been priced aptly considering its features. 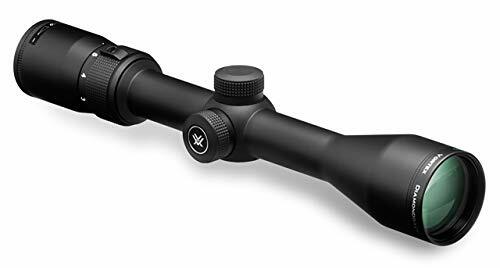 The Vortex Diamondback is a rugged and versatile scope which is also covered by a lifetime warranty. It is also interchangeable among rifles and shotguns, which is also a plus. 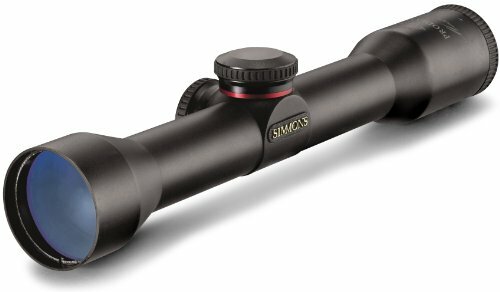 The Simmons Prohunter scope is overall the most ideal for shotguns in this list. It features a fixed magnification of 4x and an objective of 32mm. It also has a long eye relief of four inches so it can also be used for scouting applications. The scope itself is extremely durable and holds zero, no matter what conditions you subject it to. The high-quality lenses and multi-coated optics deliver extremely crisp and clear images of the target. The housing is completely waterproof and fog proof. The Prodiamond reticle makes it easy to aim at targets within a short range, regardless of the backdrop and color contrasts. The power adjustment ring also has a raised tab, which lets you adjust the power without removing your sight. The turrets are easy to adjust and hold their setting even under harsh recoil. This product weighs just 8.36 ounces and is lighter than any other in this category. Both the clarity and the handling are pretty good and it is ideal for use with shotguns. The Simmons Prohunter is an ideal shotgun scope which delivers a crisp image and handles recoil very well. It is covered by a manufacturer’s lifetime warranty which is also a plus point. A slug gun is a shotgun which has been fitted with a choke to shoot slugs which are bullet-like projectiles. Slug guns improve the range and accuracy of a shotgun to a large extent. Mounting a good scope on a slug gun improves accuracy, shooting range, and the confidence of the shooter.